I have spent the past week working on Informational Text Structures with my 5th graders. 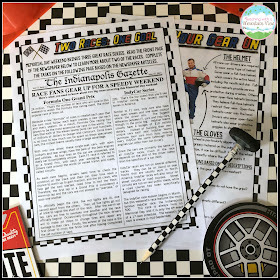 I was shocked to discover that this was almost an entirely new concept for them, so we did several fun little activities to solidify the concept. This week, they are working on their cumulative project, creating a mini-magazine about a topic of their choice with all the text structures present and a whole myriad of different text features, too. I can't wait to see their final products! 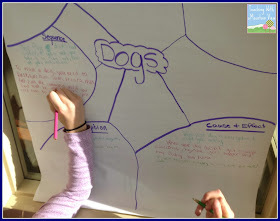 We began the unit by doing a carousel activity. 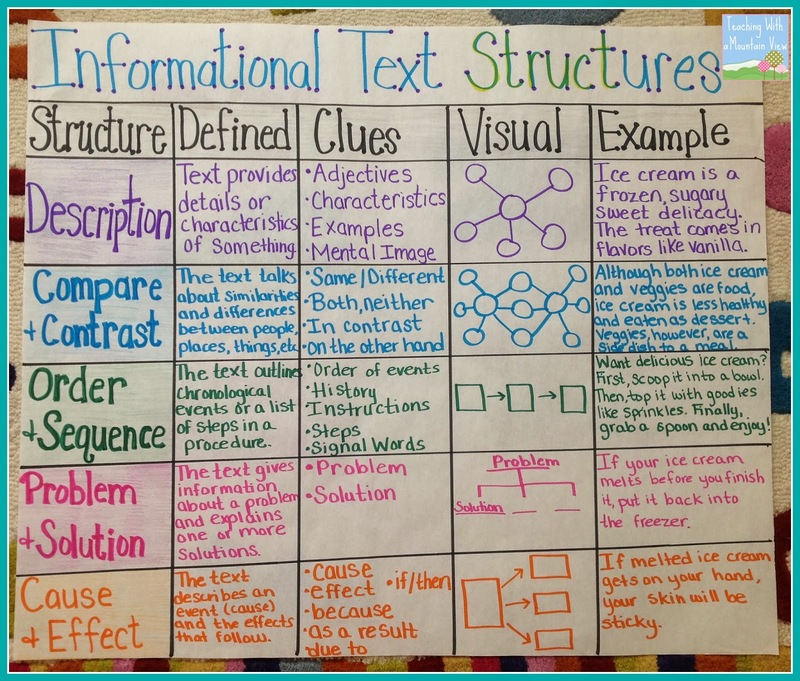 All of my students KNOW what each of the structures means because we spend a lot of time reviewing the concepts during reading. I had them brainstorm five different topics that they could write information about. Then, they divided up a piece of chart paper into a section for each of the types of structures. They got to work writing short sentences that fit the specified type of structure. (At this point, I didn't even use the term "structure." I just told them to write an informative sentence that shows each relationship.) They did a GREAT job with this! It would also be a great assessment or mid-unit activity. 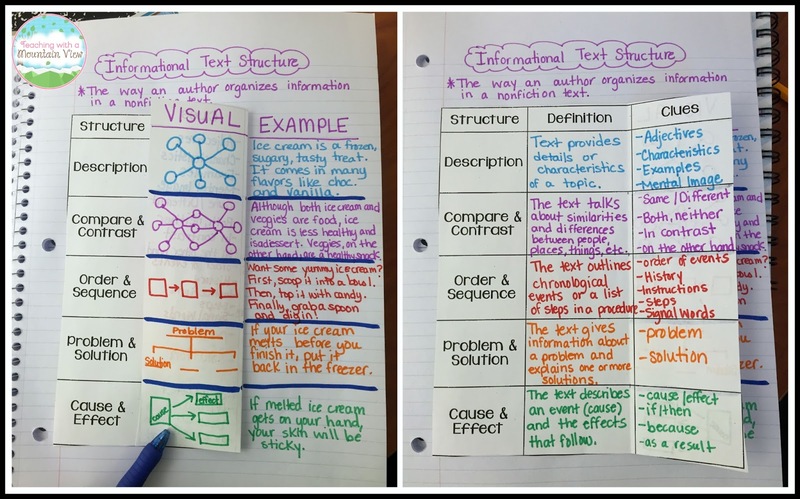 The next day, the students created a foldable from I'm Lovin Lit's Informational Text Interactive Notebook (which I LOVE and believe every upper grades teacher should own) that gives a great overview of all of the different text structures. 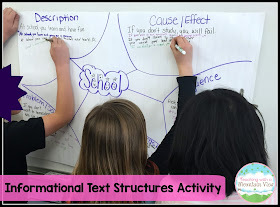 We discussed the etymology of the word "Structure" and that helped the students understand that Informational Text Structure is the way in which an author builds a paragraph or article of information. I created an anchor chart while they made their foldable. ADDED: Here is a picture of how our foldable ended up looking for the 2015-2016 school year. We are a Thinking Maps school, so my visuals were a little bit different than some others I have seen. We also generated an example (about ice cream, of course) for each structure. 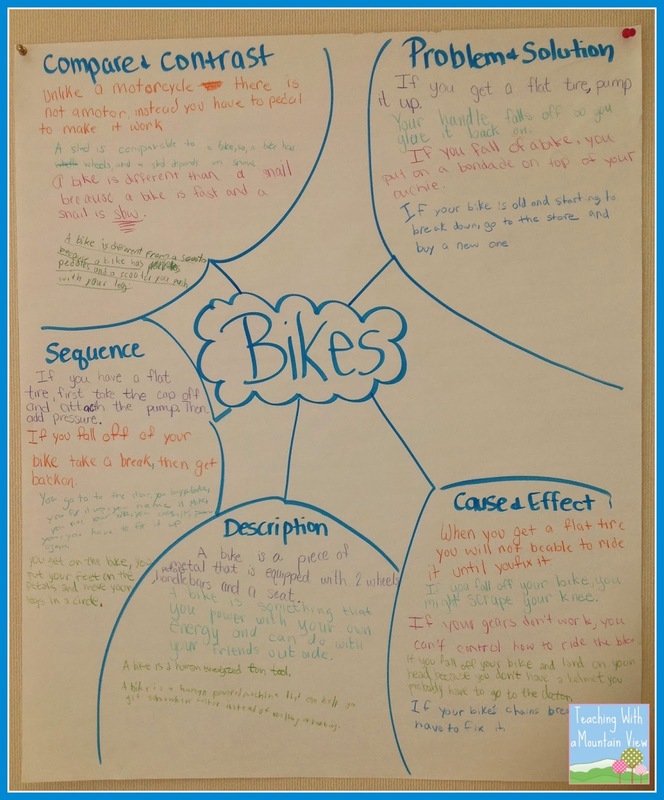 I can't tell you how many times the students have referenced this anchor chart while working on other assignments throughout the week. It looked busy to me at first, but it's full of information that the students seem to find useful. I also created a FREE text structures sort that includes short, one or two sentence descriptions that fit into each structure. The themes are super fun-- video games, swimming, chocolate chips, and fast food. I like to laminate the pieces and have students complete them in partners! 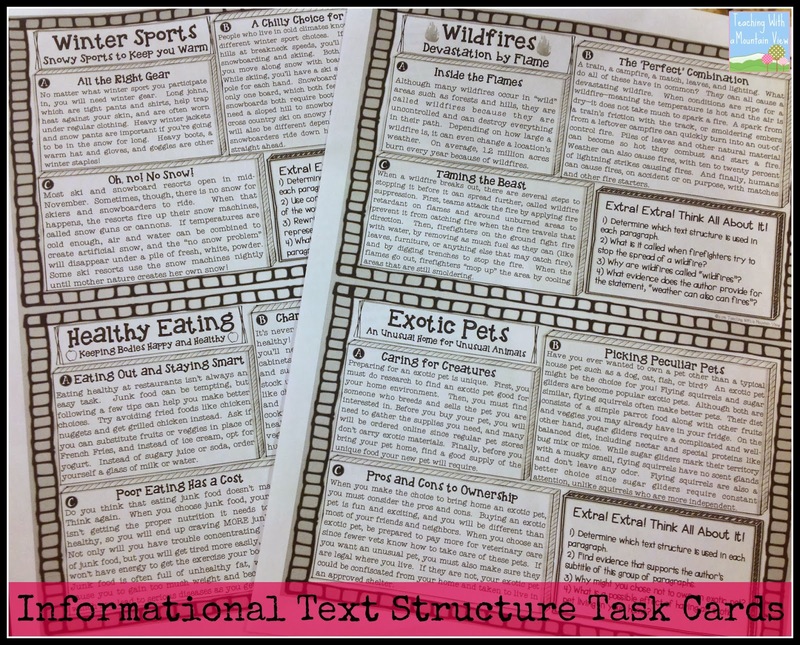 Grab your FREE Text Structures Sort! Subscribe to get my latest content by email and you will automatically receive your free text structures sort. Throughout the rest of the week, we completed an individual lesson and foldable from the Interactive Notebooks each day. 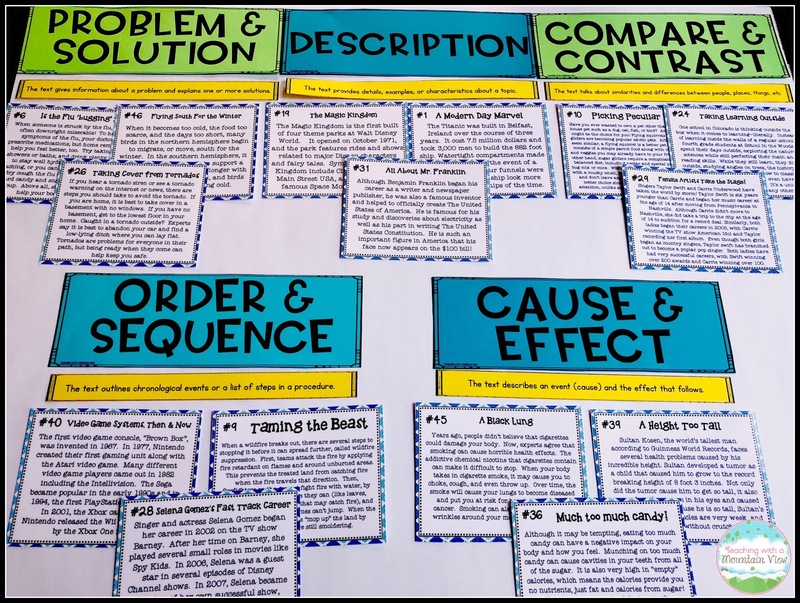 Erin from I'm Lovin Lit has included separate paragraphs and lessons for each different structure which helped to solidify understanding of each of them. Have I mentioned how much I love these?! Erin was also sweet enough to send me 5 extra free paragraphs about Alcatraz to use with my students. My students were FASCINATED by these paragraphs, and they are perfect for the older crowd. You can download these for FREE, thanks to Erin at I'm Lovin' Lit. If you haven't already, check out her blog for more great ideas! 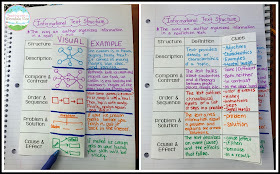 After we did the foldables, they worked on some informational text structure task cards that I created. 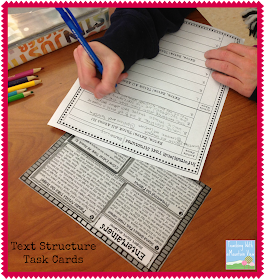 These task cards were quite the labor of love to create! I was under a time crunch to get them done since I needed to use them in my class, and each one seemed to take me forever to make. The cards include three different paragraphs, written in a different structure, about one topic. 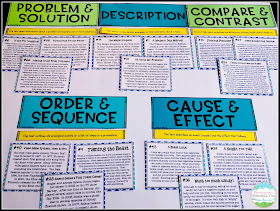 I also included comprehension questions on each card since we were working on some other nonfiction comprehension topics as well. The kids really enjoyed these and looked forward to completing their required two each day. 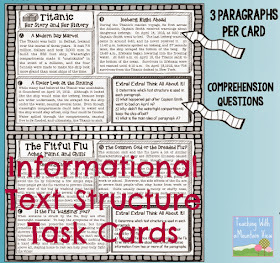 You can purchase these Informational Text Structure Task Cards at my TpT store HERE. They now include the task card version, a printable version, AND a digital version! The possibilities are truly endless. 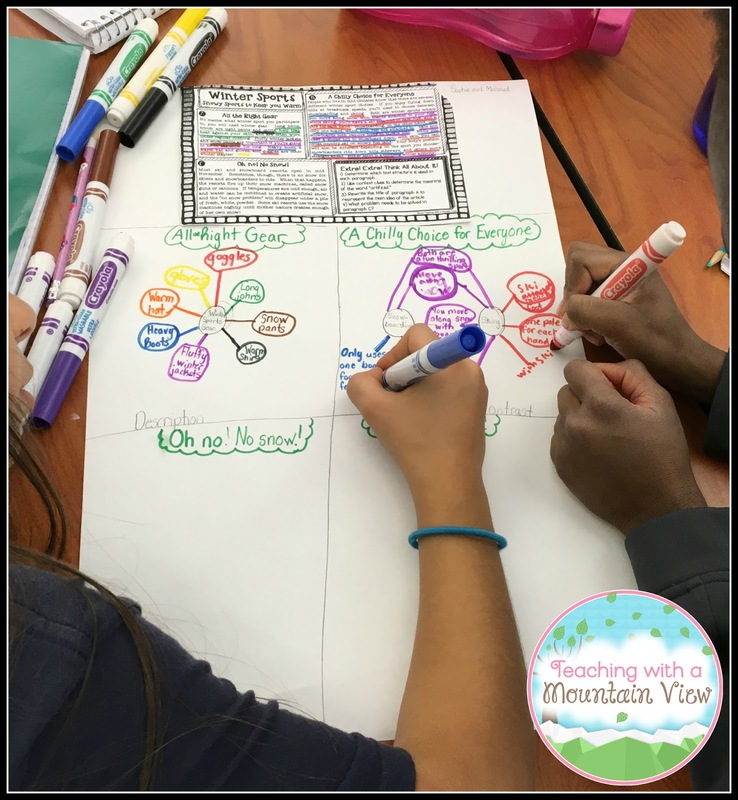 If your students aren't quite ready for this much text, the resource also includes individual passages. 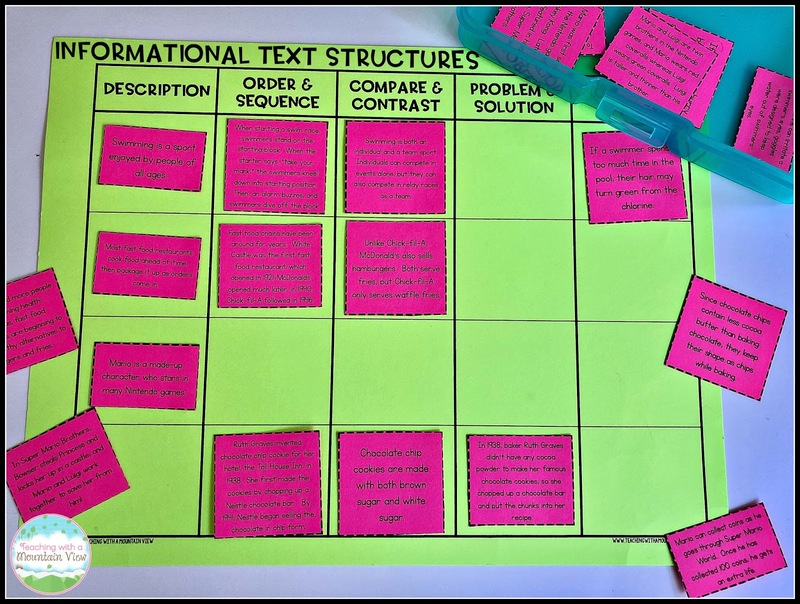 I use them as a text structures sort activity! This is perfect if you have already completed the smaller, easier sort above. 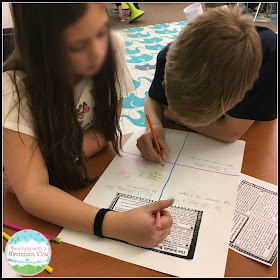 Update 2018: I have really been digging reading projects lately, as my students are always so engaged in them. 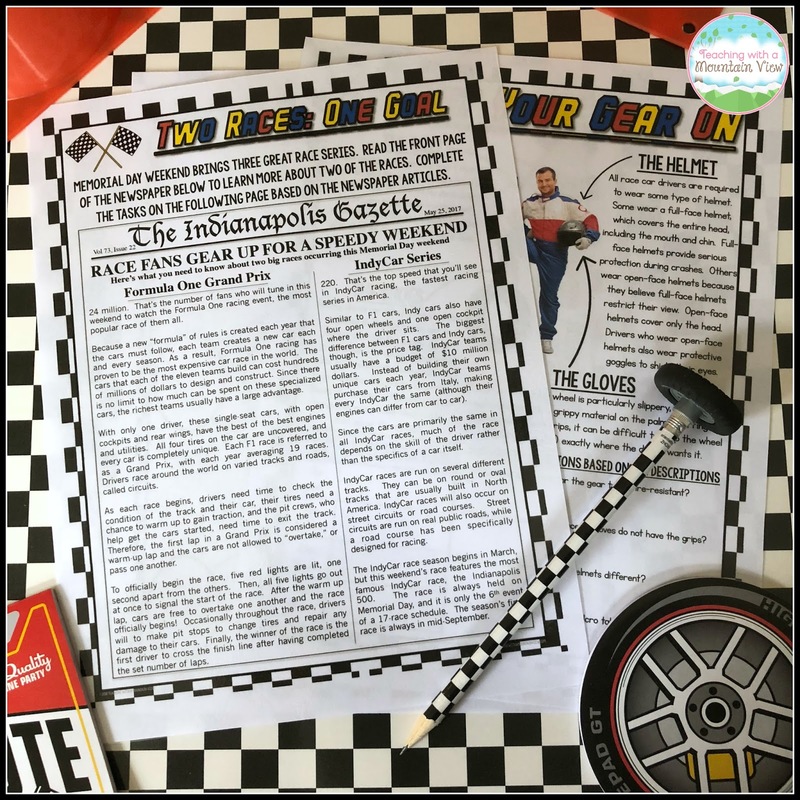 I created this super fun informational text structures reading project that has a racing theme. 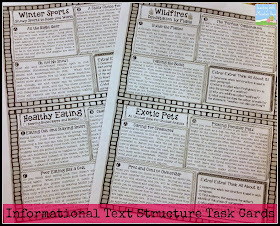 There are fifteen pages of printable resources to practice the ins and outs of text structures, and it is just so much fun! You can view the project and learn more about it HERE. Finally, we are taking an assessment over each of the structures. 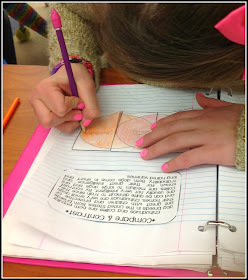 I based my assessment off of the task cards we used, and it is a good way to gauge student understanding. 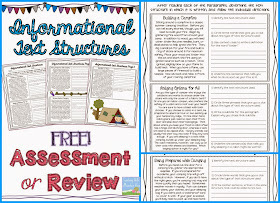 You can download my informational text structures assessment for FREE at my TpT store. I can't wait to see the final projects that my students are working on! 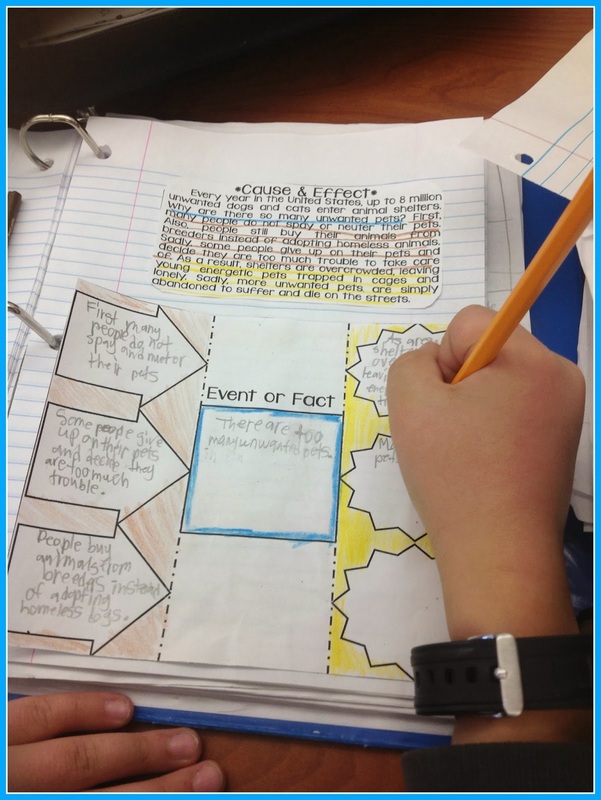 It should be a great display of their learning and of the common core standards we have been focusing on. 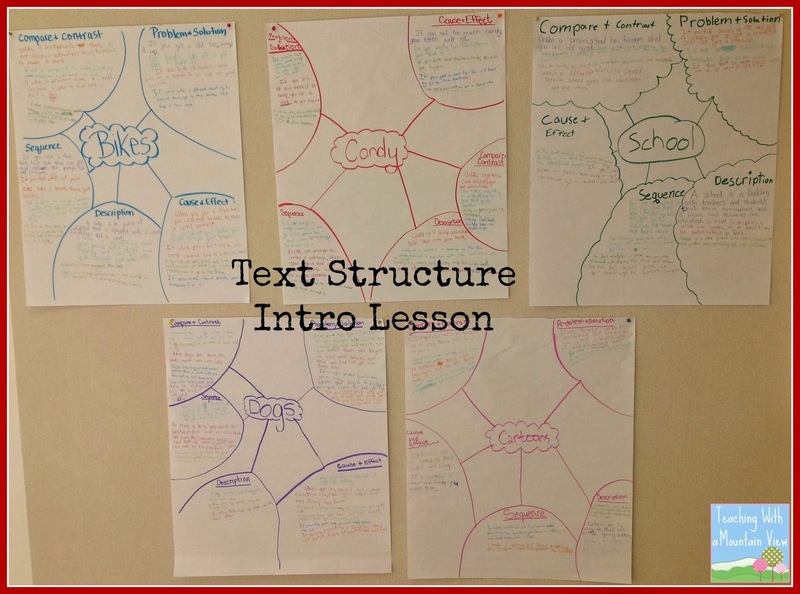 UPDATE: Here is a link to my blog post about our Text Structures Final Projects! 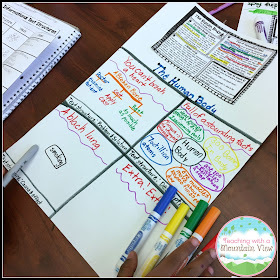 What a way to help them understand Information Text. Just in time! I'm starting on this with my sixers! Thanks for sharing. I just finished this section with my sixth graders/ and so LOVE Erin's INB's. I have both NF and Fiction. 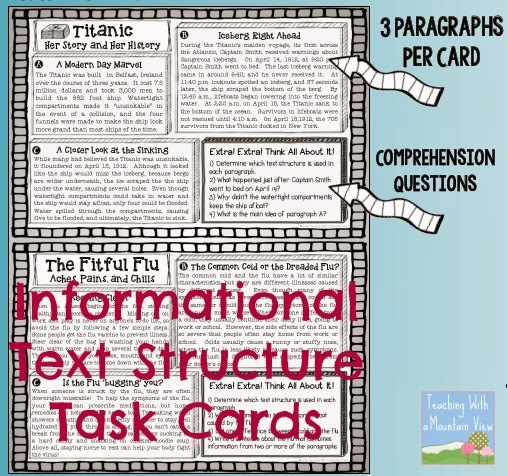 I will use your task cards as a review/and the assessment you put in too! Thanks so much!!!!!! I love the big charts with a topic and then they have to write in the five different ways! :) GREAT IDEA! I absolutely love these! 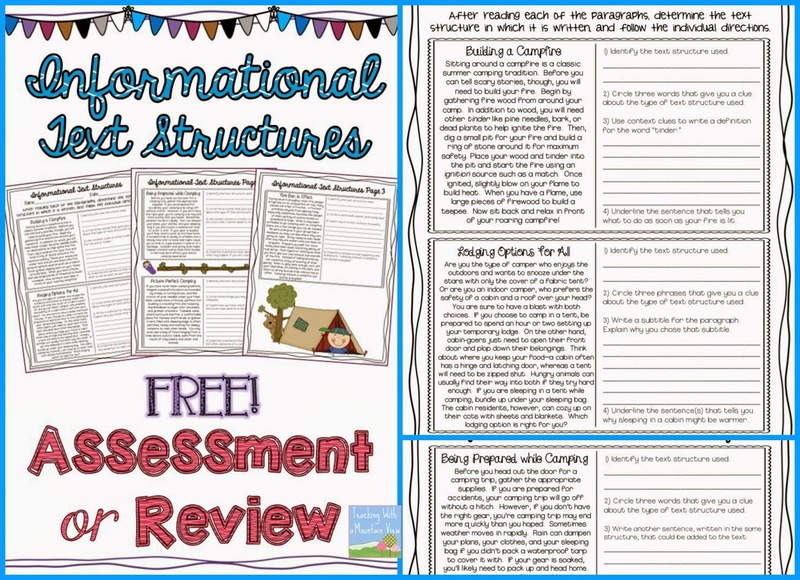 I really could have used them this year... my kids were having a hard time with text structures! I added your task cards to my wish list on TPT... I must have these for next year! Love it! 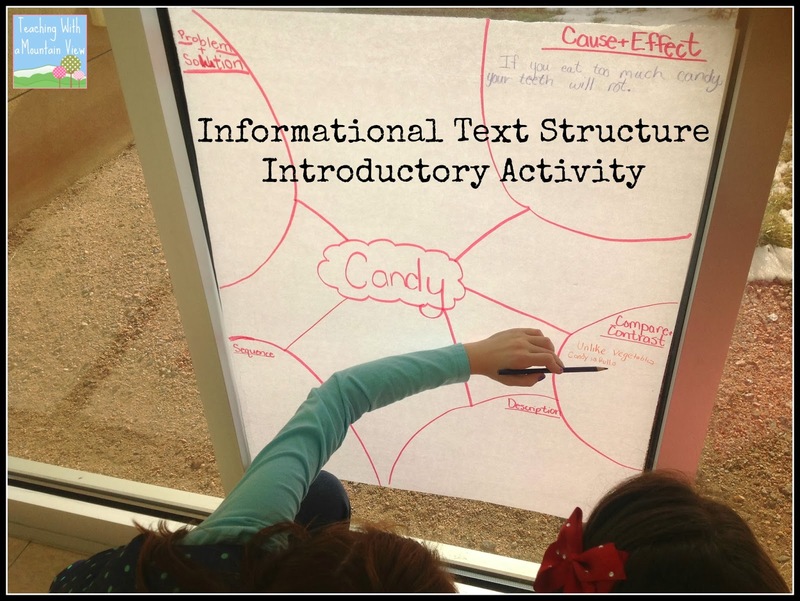 I'm thrilled I came across your post on informational text this morning (thanks to Pinterest!) as I'm starting the informational reading unit with my 3rd graders tomorrow! 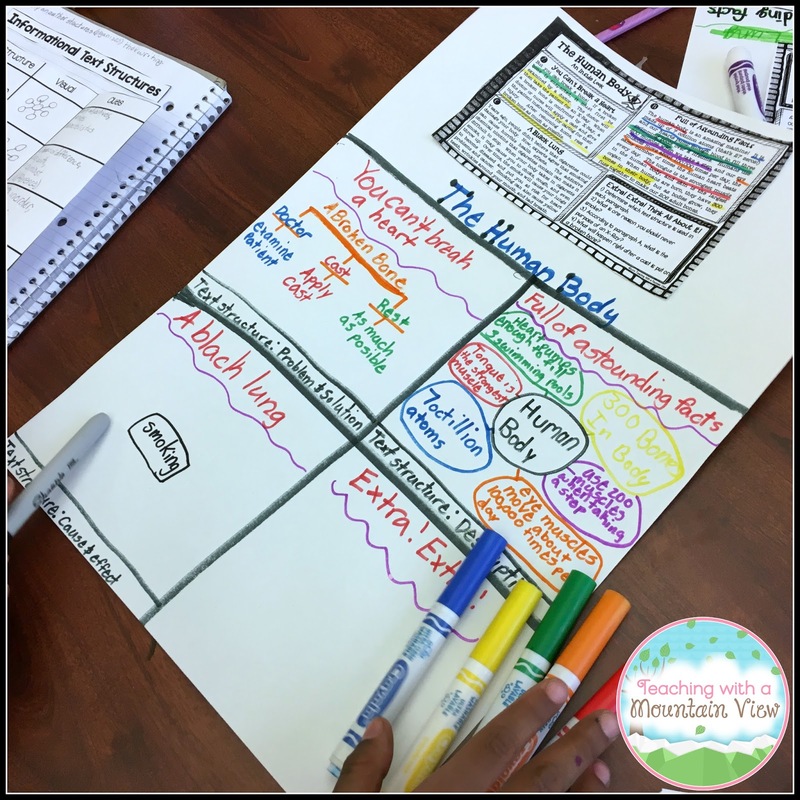 I love how you organized it, you've given me some wonderful ideas to adapt for my kiddos! Thank you so much! Very well organized!!! Thanks for sharing. You're a genius! I truly love how involved the students are throughout the lesson! Thank you for sharing your ideas! Great wotk! Do you need professional essay writing help? Hello!) Once we have learned about text structures in my college. And then I have to write an essay. Ordered it I here www.best-essays-writers.com. This post is really interetsing. Thanks for it. If you want to get well-written essays at reasonable prices, go to http://essaywritingstore.com. Cheap academic essay help here online! People would order custom written essay about this good topic, choosing the essay writing services. You definitely will need use plagiarism checker. Now, you don’t have to worry about getting a failing mark simply because you have been accused of plagiarizing someone else’s work. WOW! what a beautiful plus attractive Informational Text Structure, i have never seen before. I love all of your ideas. 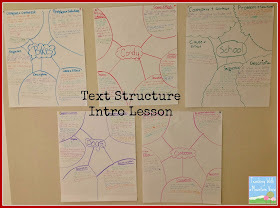 I am always looking for new ideas on text structure. 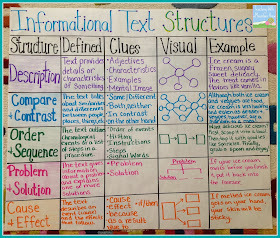 I am teaching text structure next week and plan on trying some of these. I am curious about the sequence of the activities that you did during the week.